August of this year will see the 50th anniversary of the world’s fastest Indian, a remarkable event in motorcycling history. 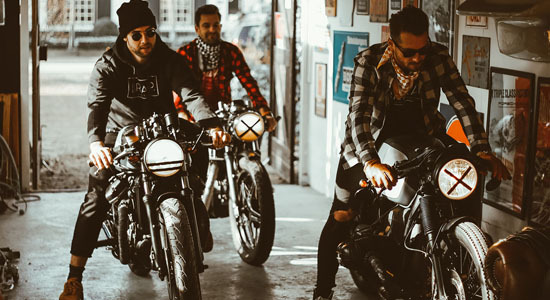 Discover how the spirit of Burt Munro lives on, as Indian take to the Bonneville Flats. 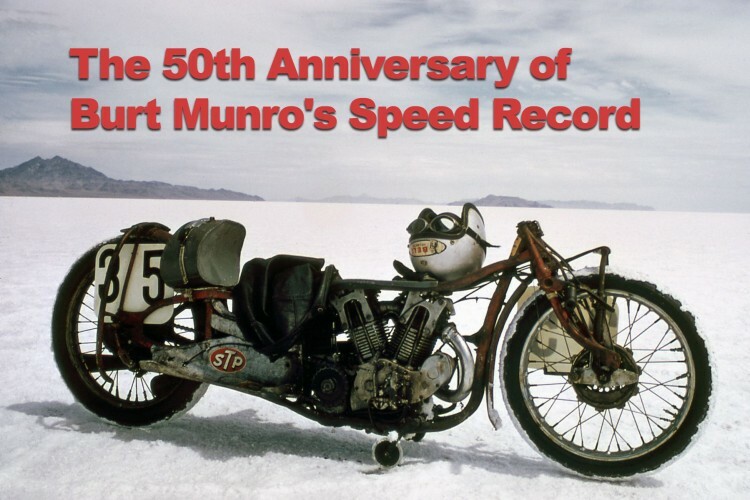 50 years ago, Herbert “Burt” Munro set a land speed record that still stands today. On a 48-year-old Indian Scout, the 68-year-old Munro thundered down the Salt Lake track at 184.07mph to set a world record speed in the under 1000cc streamliner class. If you think that’s incredible, one of his unofficial runs timed him at a fraction over 200mph! But the most amazing part of this story starts long before that famous day. In fact, it starts in the last year of the 19th century when Herbert James Munro was born. It would be easy to imagine not a lot happening in the most southerly town in the world at the very tip of New Zealand. However, the internal combustion engine was changing the world, and fantastic mechanical devices even made their way to Invercargill; Munro’s hometown. Working on his dad’s farm, a young Herbert satisfied his desire for speed by riding their only horse flat out, but the moment he saw his first motorcycle, there was no going back. 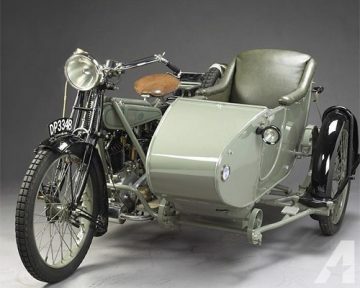 In 1917, a local dealer started importing British made Clyno motorcycle and sidecar outfits. At first sight, Munro drew every cent of his savings out of the bank and bought one. 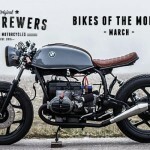 Within a month, he’d dumped the sidecar and was racing the 6hp V- twin at local events. Three years later, that same Invercargill dealer brought over the first batch of Indian Motorcycles. The day after they hit the showroom floor, Munro had sold his Clyno and rode away on a brand new 606cc Indian Scout. The Scout was quite advanced for its day, being the first American made side-valve V -twin to have a separate transmission attached to the engine casing. This design allowed for a much more robust geared primary drive for the 3-speed hand change box. Munro was over the moon with his new purchase. Although the top speed of 50mph was pretty impressive for the day, it wasn’t long before he started ‘messing about’ with the engine. 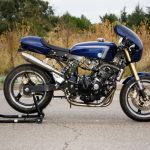 This purchase heralded the beginning of the Scout’s engine development, which would last for over 50 years and eventually see almost every part of the bike altered and improved beyond recognition. Without any formal training, Munro’s engine tuning was all trial and error. The story of the Scout’s increase in power and speed marked by the countless blown engine parts that weighed down the shelves of his workshop. During those post-WWI years, the New Zealander’s appetite for any competitive motorcycle sport was insatiable, from hill climbs to sprints. 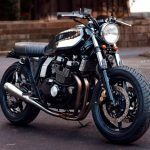 He even set a record for riding 116 miles on a single gallon of petrol, as well as touring NZ and Australia as a professional speedway rider. However, it was the competitions of outright speed that he enjoyed the most. This era was a dark time in the world’s past, the Great Depression reached the southern hemisphere, and Munro quit touring and returned home to Invercargill. He married, wife Florence who presented him with four children and Munro secured employment selling motorcycles. Still competing in local events, his ability for pushing the trusty Scout to faster and faster speeds was gaining him a well-earned reputation throughout New Zealand. By now, he had also added a 1936 Velocette MSS to his collection and tuned and raced both bikes successfully. In 1940 Munro set a NZ open road speed record of 120.8mph, it would stand for 12 years. But the exhilaration and satisfaction of pushing the Scout well beyond the limitations of its original design would stay with him for the rest of his life. Hooked on speed, there was no going back. This obsession was unfortunately to the detriment of his family. In 1945, Munro’s decision to quit work and concentrate on developing the Indian and Velocette caused a rift in the family that ended in divorce. Moving to the other side of town, he moved into a lock-up shed, placing a bed right next to the work bench. Without any distractions, he embarked on a ten-year stint of 16-hour days. 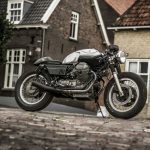 Both bikes slowly began to evolve into record breaking test beds for his tuning theories and experiments with different metals. If this makes Munro sound like some degree certified engineer with a fully equipped machine shop, the total opposite is true. Any mechanical aptitude was purely instinctive, with ingenuity fuelled by thrift and a shoestring budget. Using a micrometer made from a notched spoke, he cast pistons in a can, turned down on an ancient lathe and hand-filed cam lobes and conrods. The complicated mechanical designs to boost power thought through in his head before being executed over countless hours by hand. Although he loved the Velocette, it was the Scout he saw the most potential in and over the years increased its power output past anything thought possible. Making bigger cylinders out of old cast iron gas pipes, and designing a new lubrication system. Followed by a triplex primary drive and conversion to a 4-cam system to drive the overhead valve heads. All of which, were designed and built in his shed. The early part of 1957 saw Munro shatter another speed record, thundering down the local beach at 132.38mph. But the Indian was getting too quick, and the desire to see what she could do flat out led him to look at the SalSalt Lakes of Australia. Due to their isolated locations, land speed attempts in such places hadn’t yet caught on, though. The opposite was true in America, so taking his first vacation in over 30 years, Munro once more used every cent he had taking a tramp steamer to the US. His excitement at seeing the seemingly endless Salt Flats of Bonneville made him realize that this was the place to be, and he vowed to return with the Indian Scout; name the Munro Special. It took almost five years to save for the trip and together with funds raised by friends and local bikers; Munro finally sailed the 6500 miles back across the Pacific Ocean to Los Angeles. Working his passage as the ships cook, but finally, arriving in America. Buying a kicked in Nash station wagon for $90, he loaded the Indian onto the back of a trailer and promptly headed for Utah. On his arrival, he discovered Bonneville Speed Week already under way. The crusted salt littered with flashy looking two and four wheeled vehicles. Teams of mechanics and sponsored riders in matching outfits were everywhere. And into all the commotion, Burt Munro unloaded the diminutive Scout, resplendent in its maroon streamliner body. 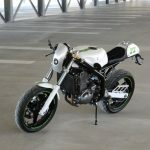 A motorcycle that had taken over four years of trial and error to get right. 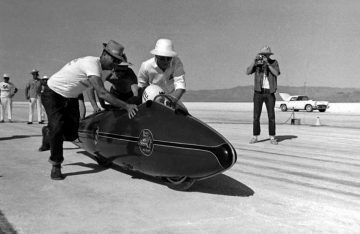 Unlike NZ where racers just turned up and gave it a go, Bonneville had officials, rules, and regulations. Burt was refused a run because he hadn’t pre-registered, and it took intervention by Bonneville record breaking regulars Rollie Free and Marty Dickerson to overturn their decision. The unassuming Kiwi was a hit with everyone. Free and Dickerson’s decision to get him a blast down the salt was more to do with the eccentric having traveled across the globe to be there. Besides, they figured, the battered old Indian Scout probably wouldn’t go fast enough to get into any trouble! Wearing an old Bell open face helmet and suit trousers tucked into his socks, Munro climbed inside the streamliner, and willing hands gave him a push start. Completing his two runs the Munro Special clocked a record-breaking speed of 178.97mph and those present, recognizing the magic they’d just witnessed went crazy. In all, Burt Munro raced at Bonneville no less than nine times. During which time, he suffered a mild heart attack while going into a violent 150mph weave, crashed at 180mph and made an unofficial run timed at a fraction over 200mph. He did however set three official land speed records. It was the run of 190.07mph in 1967 though, that officially made him into the builder and rider, of the world’s fastest Indian. A record that still stands to this day. Despite being a legend on the Bonneville Salt Flats, back in NZ, he was still just that crazy old bike racer who lived in a shed. 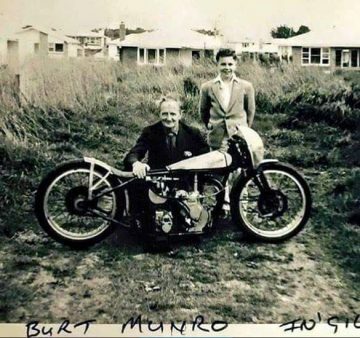 In 1975, with worsening health, Burt Munro lost his competition license and finally conceded that his racing days were over. Wanting his son John to take on the Scout and Velo, but being unable to raise the money he sold the bikes to local hardware shop owner and long-time friend Irving Hayes. Munro making Irving promise that the bikes would never leave Invercargill. 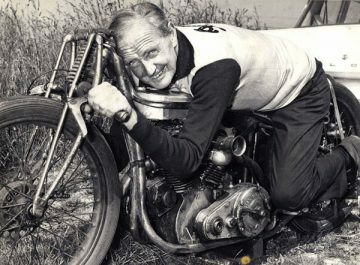 On the 6th of January 1978, Burt Munro passed away peacefully and in relative anonymity, his heart and innumerable crashes eventually taking their toll. It wasn’t until the release of Roger Donaldson’s movie the ‘World’s Fastest Indian,’ that the world finally appreciated the unassuming Kiwi’s mechanical genius and dedication to the pursuit of speed. 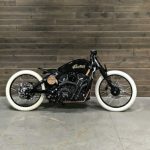 To commemorate his incredible achievement, the Indian Motorcycle Company have built a tuned Indian scout to compete at this year’s Bonneville Speed Week in August. Burt’s racing DNA indisputably passed on, with great grandnephew, Lee Munro riding the bike. 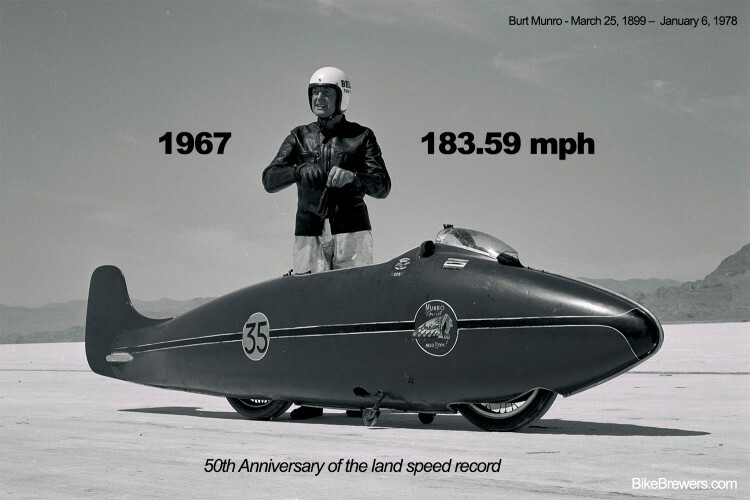 The 1350cc Indian, called the Spirit of Munro had its inaugural run at El Mirage in July and hit a top speed of 183.59mph creating a new record in the Modified Partial Streamliner, gas class. 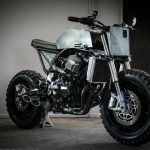 The motorcycling world waits with bated breath to see if Lee Munro can push the Indian still further for its debut at Bonneville in August.